Technical ability, knowledge, and expertise are a well known part of the Midland Asphalt culture. Midland Asphalt has three professional laboratories to meet our clients’ customized needs – Tonawanda, NY, Lyons, NY and Clearfield, PA. Each laboratory is under the supervision of an AASHTO Certified Laboratory Technical Manager. In addition, each laboratory is staffed with highly educated personnel from various disciplines, integrated to be proficient with Quality Assurance, Quality Control and Troubleshooting. The Tonawanda, NY lab is involved with emulsion and aggregate testing, mix designs, and is AASHTO Certified for Emulsion Testing. 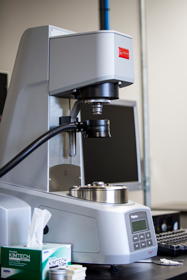 Our second lab, located in Lyons, NY, offers emulsion/aggregate/binder testing, mix design development and is AASHTO Certified for Performance Graded Binder Testing. The third laboratory is located in Clearfield, PA and provides emulsion, aggregate testing as well as mix design development. The Strength of these laboratories is the ability to offer quality and economical options for your road preservation needs.